Roll the dice and see what's cooking with this foodie-friendly set that makes everyday meals extraordinary. 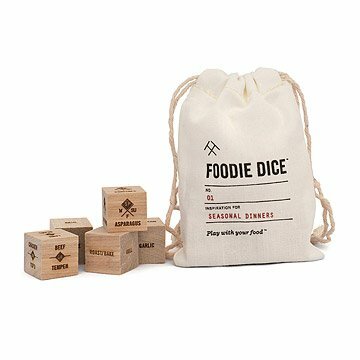 Whether you're new to the kitchen and need some ideas, or you're a seasoned chef looking to shake things up, these foodie dice make sure that no two meals are alike. Laser engraved on wood, five primary dice offer protein options, cooking methods, grain/carb selections, herb choices, and bonus ingredients. Four additional dice offer seasonal veggies to spice up your dish. Simply roll and accept your challenge. With over 186,000 possible combinations, this foodie essential comes in a cotton muslin drawstring pouch and sparks creativity in the kitchen while inviting you to take a gamble with family dinner. Designed by Liz and Sarah Downey; made in the USA. Click here to learn about the possible combinations you can make with your Foodie Dice. View all of our recipe dice here. Each set includes nine 0.75" cubes. Help with Dinner Choices Dilemmas! Don't we all have decisions about what to cook for dinner? Roll the dice and let them decide what to cook. Unique and fun gift. These are so much fun to use! We like to roll them at the start of the week to get ideas for grocery shopping. It's great that there are all vegetarian alternatives for the main proteins, but a bit bizarre that there's then a "bacon" side on a different die. And of course the best part is when you roll a meal that sounds almost great but has one weird element that doesn't go, you can always roll again! This is an ideal gift for adventurous eaters who host dinner parties and don't like to make decisions. Roll the dice and see what ingredient to add to your dish. We love to cook and use the Foodie Dice all of the time to help us decided on ingredients and plan fun meals. If it was bigger in size I would probably buy more sets.